Do you want to know what they have they been digging down at Priory Park? What does it feel like to ﬁnd something exciting on a dig? Come and find out at the Archaeology Discovery Day at Priory Park, Lewes, this Saturday 12th March 2016! A tame archaeologist will be waiting to answer all your questions and explain our recent ﬁndings at the Priory. You can even have a go yourself at digging for mediaeval (replica) coins, or learn to ﬁre an arrow at a target. A beautiful and detailed model of the Priory, showing its development over its 500 year history, with Trust historian Arthur Franklin on hand to demonstrate and explain. The prototype of a new board game – A Monk’s Life: based on the lives of the monks at the Priory – will also be on show. Try it out and feed back any comments before the game goes into ﬁnal production in April. You can also try out a new interactive virtual archaeology game called Yeast of Eden, based on the Priory and what has been found there. The game promises all the thrills and disappointments of real archaeology without having to get your hands dirty. Lewes Priory Trust, which look afters Priory Park and the ruins, are organising the day. many people as possible to come with us on this journey of discovery”. The Archaeology Day runs form 12 midday to 4 pm on Saturday March 12th at Priory Park. The event is supported by the Heritage Lottery Fund. 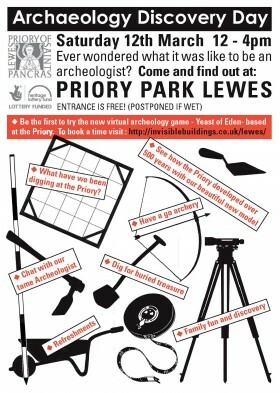 For more information see the Lewes Priory website or contact Helen Chiasson 01273 483462.